I never seen to manage to catch themes and pull together lists for ‘Top Ten Tuesday’s at The Broke and the Bookish) at the right time, but this week I’ve finally done it! A lovely and unusual coming of age story, set in Victorian England. I was captivated by the wonderfully wrought story, of an England that had been rebuilt with have the history and presence of magic quite beautifully woven in. I was nervous about meeting the Provincial Lady, but when I did I found her such wonderful company that I quite forgot my shyness. This story of English and German cousins, set as World War II begins, shows D E Stevenson’s strengths and has almost none of her weaknesses. Storytelling so rich, so profound, that it held me from start to finish of a ridiculously long book. A slow and thoughtful story of lives reshaped by war, and of the importance of having a place in the world, told with love and understanding. A Victorian novel that really should be better known: it grows from a melodrama, into a psychological novel, into a courtroom drama …. I love Mary Stewart and I love governess stories, so this was heaven. My book of the year to date. It took my breath away …. Which books would you pick out as your favourites this year? « An A to Z, with clues to the game from Briar and (mainly) bookish thoughts from Jane …. What a brilliant list of books so congratulations on making your decision this week! Here’s to lots more good reads in the rest of 2014. What a lovely selection Jane – I don’t know if I could pick favourites so far! The only one of these I’ve read is The Count of Monte Cristo, but it’s an all-time favorite! I can only decribe this list as rich and enticing…oh my. I have a stack of books at my elbow right now I am working through (all by the same author) but I can’t wait to get to a couple of your selections! Have I mentioned lately you are amazing?? Thank you for the suggestions! These lists are such fun! I am taking notes all over the place. I hope the second half of 2014 brings you just as many wonderful books. What a fabulous list! sounds like you have had some great reading there! That’s a great list. 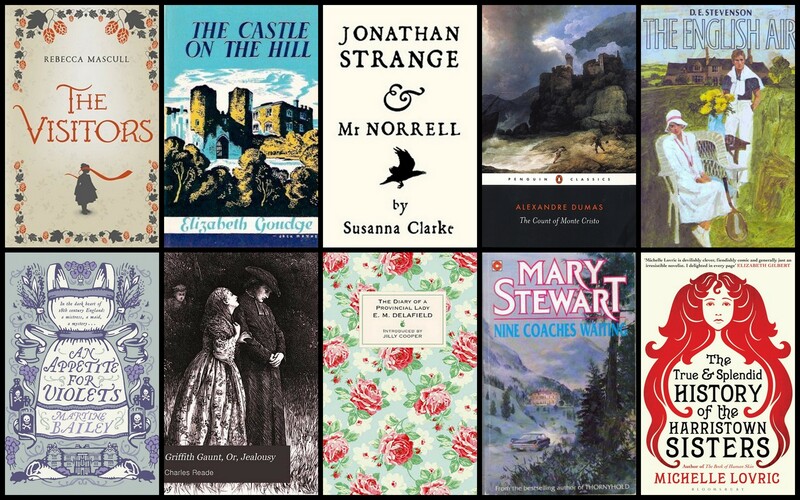 I’ve read and loved some of them (Jonathan Strange, The Count of Monte Cristo and Nine Coaches Waiting) and would like to read all of the others! Lovely to read your selection and get ideas. The only one I’ve read is The Visitors, which I loved. You always have THE best reading recommendations. I immediately requested a galley of the Michelle Lovric book and I’ve already been approved! I can’t wait to read it. Love, love, love the Prov Lady. Great list. I discovered Mary Stewart this year and Nine Coaches Waiting was one of my favorites. For me Hild by Nicola Griffith is the standout book of the year though — and I haven’t even finished it! I also recommend My Life in Middlemarch by Rebecca Mead, a wonderful mix of biography, criticism, and memoir.